On February 7, 2009 Victoria had the worst bushfires in the nation’s recorded history. Black Saturday, claimed 173 human lives and destroyed 2029 homes.1. I started the @bushfires Twitter account two days later. For a bit of context, I’ll talk about Twitter in the ‘early days’. Twitter originally launched to the world in early 2006, with the first tweet being sent by the co-founder in March. @Bushfires was created on the 9th Feb 2009. Growing up in rural South Australia, bushfires were a realistic threat, moreso living out of the local township. Mobile reception didn’t exist at home, so any warnings would have to come from the radio, a phone call, or a knock on the door. Being interested in technology and with ‘Twitter’ being the popular new thing back in 2009, it was great to see people and organisations making use of Twitter in more innovative ways. And I hoped I could add my 2c to make it easier for someone. Anyone. Hopefully. Back in 2007, Twitter didn’t have ‘search’ anything like what it is today. ‘Track’ was introduced in September 2007, where you could ‘track’ a keyword via SMS, or over instant messaging.2In 2008, Twitter improved things by acquiring a startup called Summize in July 2008. After the acquisition, Summize became Twitter Search and lived on it’s own domain at search.twitter.com. It wasn’t until mid-Feburary 2009 that search became slightly more integrated into your Twitter timeline. In addition, Twitter had a lovely set of open APIs which was a free for all. It was incredibly easy to pull data from Twitter, including the search API. There was also no such thing as an ‘official’ or ‘native’ retweet until later in 2009, so there was the character limit to deal with, and other people ‘retweeting’ in their own ways. With Twitter ‘apps’ less than elegant for smartphones, and the website not making it easy to pull specific results out, I decided to see what I could do, and use the @bushfires account to share it. In 2010, it was estimated that there were approximately 2.5 million Australians on Twitter.3Most recently, Business QLD has stated that there are 2.9 million Australians on Twitter. 4Aleisha Orr, a reporter for WA Today, put together an article titled Twitter playing a role in #bushfire emergencies in 2013. According to the Australian Bureau of Statistics half of all Australians had access to the internet on their mobile phone in June 2013. Social media platform Twitter, available via SMS and online, has proven its worth so well during emergencies that Western Australia’s Department of Fire and Emergency Services is considering using specially designed software that monitors eyewitness accounts on Twitter to map and respond to bushfires in WA. Originally, the tweets were less than ideal. They consisted of ‘RT @Username: Tweet with #hashtag. URL of Tweet’. This meant the retweet also contained the hashtag (adding to the feed). I then played around with swapping the ‘RT’ for an (via @username) on the end of the tweet. The hashtags were still part of the retweeted tweet, however. (again, cluttering the feed).Twitter didn’t have it’s own URL shortener, so I needed to use a third party one. The biggest problem was dealing with the character limit; being able to show the important details, while still being able to credit the source. This tweet shared the whole retweet, shared who it was from; but had the original tweet URL truncated. Ideally, this should have simply been left off. Other later tweets simply were truncated, with the original Tweet URL always posted on the end. Later, I stripped out the hashtags (so #bushfires became ‘bushfires’), avoiding adding duplicates to the feed. This was the best that could be done, and unfortunately some tweets ended up appearing a little odd without the hashtags, but the main message was there. Unfortunately, in the middle of all this; spam became a problem. With #bushfires and other related hashtags trending, bots started peddling their wares, using the hashtag and being retweeted by @Bushfires. By this time I had added a collection of search filters. A tweet couldn’t start with RT. Tweets that started as a reply weren’t shown. Tweets that contained viagra/cialis/etc wouldn’t be retweeted. Later in 2009, I tweaked the RT to simply wrap the username in brackets, to start the tweet (ensuring it wouldn’t be truncated). I believed that this would be enough to drop including the tweet URL in the tweet (which was usually truncated anyway. It was in 2010 that Twitter started changing API requirements, while at the same time improving their website, and third party applications were also improving. At the same time – more and more people were joining Twitter, and tweeting. There was a lot to take in and share if the @bushfires bot continued to republish all that was shared. Search on twitter was improving, while users on Twitter were also following accounts more relevant to only them (e.g., RFS, CFA or CFS). 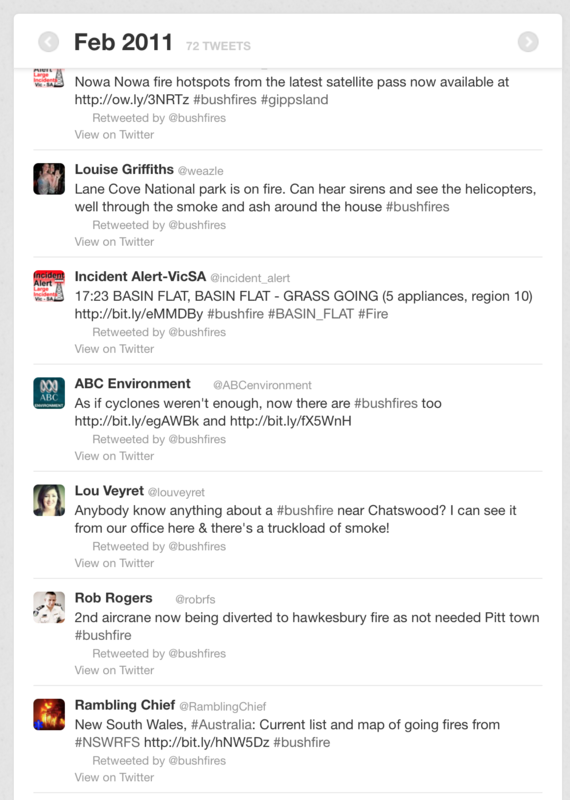 @bushfires made a brief return in early 2011, using the new native/official retweet functionality. At this time, it was decided that @Bushfires wasn’t adding anything that wasn’t already available through third party applications or Twitter’s own search. As such, the @bushfires bot has been left dormant. In addition, @bushfires was also ‘identified’ in as a leading digital citizen for a #gov2au presentation.